Join the discussion on our forums! Come discuss Herald Volazj over in our dedicated Herald Volazj discussion topic. Easily one the coolest sound intros, especially with the effect it does on the board. It's sad this card never really had its glory day, would love to see more of it. Best card for my deck! I'm happy that crafted it. I wish they kept his in game wow voice, he would just sound like hes drinking water while talking, while the legendary music plays in the background. 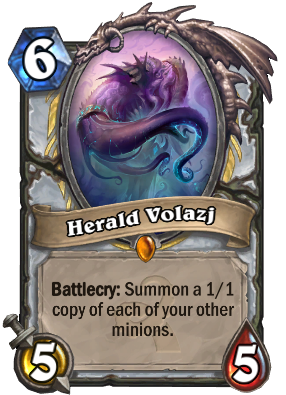 Volazj's probably the strongest Priest legendary atm. He may complete the quest single-handedly. Possibly THE best entrance sound in WoTOG, and contender for the best entrance in the game, actually. Also, anyone thought of the synergy with Kel'Thuzad in Wild? Blood of The Ancient One anybody? If Blood of The Ancient One worked in Priest. I really hoped it would but I have only ever had any kind of success with it in a Druid deck. I have a question regarding this card cause I don't have it. When it copies a minion does it put a card effect on it? Because when I was playing the Magic Mirror adventure (2nd one on first wing) in One night in Karazhan), I noticed that the 1/1 cards it makes has a 1/1 Reflection status effect on it. When you silence it, it returns to its original stats. I tried it with Ancient Watcher and Eerie Statue and their 1/1 copies returned to full stats after throwing in Wailing Soul. drew Volazj in the 50 pack Old Gods pre-purchase. Priest was by far my most used - and favorite - class, before Old Gods. I've been trying since its release to figure something out, and honestly I feel building around or with Volazj hurts my Priest. Priest altogether feels knocked down by the Old Gods expansion. The obvious dream is to copy Sylvanas, Thaurissan, Ysera, cards that produce with or without stats. That being said, I think Volazj should have been designed as a lower cost, lower statistic card. No one is going to use him strictly for his stats, so why raise his cost and attack/health? Quite honestly, a 1/1 for 3-cost Volazj sounds far more appealing than a 6-cost 4/6. I feel like I have enough to do at 6 mana, as a Priest, without Volazj, so he just sits there waiting for the right moment, which never comes; when the right time does, you've likely already won and are simply showing off. I think the idea of copying a board is awesome (Brann+Sylv+Thaur, anyone? ), but not for the cost that Volazj requires. 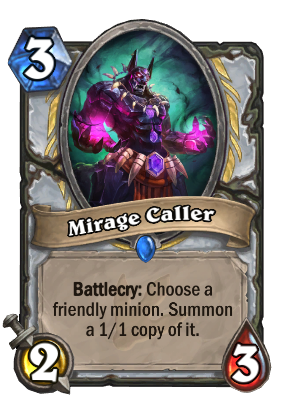 It's like Blizzard came up with an idea and decided to nerf the piss out of it before ever releasing the card. I've probably played 100 games with a Volazj-oriented deck, and am sad to say I am about to remove him, when I finish this writing. Such a fun theory, such a bad cost to put into practice. He's best in N'zoth Priest, especially in Wild. Dark Cultist, Shifting Shade, Sludge Belcher, Infected Tauren... very good control swing. ...a 1/1 for 3-cost Volazj sounds far more appealing than a 6-cost 4/6. Some things I have discovered with this card when messing with it. Priest is missing a few big pieces for zoo. The biggest is burst dmg. Mind Blast is good burst but lacks the flexibility of power overwhelming when you need a board clear. Spawn of Shadows also has burst but still lacks flexibility. The other problem is sticky minions, but the dragon set helps a bit. Card draw is an issue, but there are a lot of options to try, forbidden shaping, though steal, sir finley, museum curator, etc..
Argent Squire is VERY good, 7 mana 5/5 two 1/1 divine shields. Loot Hoarder, Polluted Hoarder, Shifting Shade are good at drawing cards but going all in on card draw is fairly weak and inconsistent. Dragon Synergy gives priest some of the strongest early game minions in Hearthstone..